From an island where guests gather to see what’s cooking to functional lights over the kitchen table, unique pendant lights are our favorite accessories. We can add colorful glass to the transitional home, and reclaimed vintage steel lighting made in the USA to a brick walled loft. The thing is, a pendant adds style AND light to a room by saying, “Look at me!” Choose from more than three-dozen Pendant lighting manufacturers here, or visit our Madison WI showroom and see many special and unique pendant lights up close. Want to draw the eye up in a conversation area? Choose a cluster of glass pendant lights hung at different heights. Want a unique look in a small bath off the foyer? 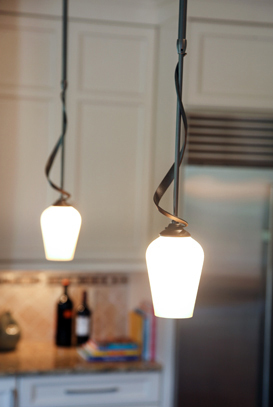 Select a pendant light to hang over the sink. 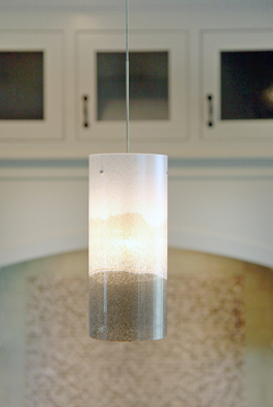 Pendants can light a stairwell, or add personality to a breakfast bar, and splash light on a café table. They’re versatile because you buy the number of pendant lights you need to create the desired effect, and, customize the height when you hang them. 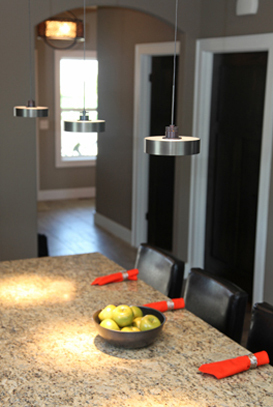 Consider adding recessed lighting in the ceiling over your pendants to really call them out. Small recessed fixtures will shower light directly down on the surface you wish to light and combine with pendants beautifully. Recently, a talented customer we know used egg-shaped clear glass pendants to light a small conference table in an office she was decorating where we’d usually see only recessed lighting used. The combination shed more effective light on the table and brought her décor to the center of the room, up above eye level. We like Tech LBL Lighting and for their unique and artful pendant lights. We offer hundreds of pendant lights from dozens of manufacturers, including hand blown Murano glass in vibrant colors so each piece is unique. With so much style and so many to choose from, pendant lights are popular with our Certified Lighting Specialists, Interior Designers and the Do-it-yourself home decorator.